Step 1 — Any cracks or holes in the concrete will be repaired. Step 2 — We prep the entire floor with a dust free diamond grinder. 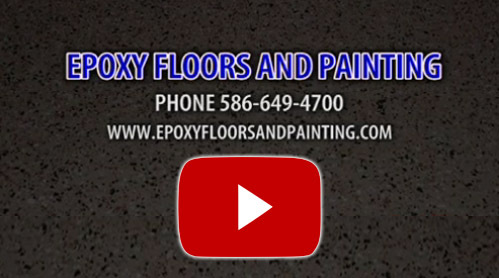 This process removes a thin layer of concrete, along with stains, dirt and oils, and allows for a superior mechanical bond with the epoxy. Acid washing is inadequate, is toxic, must legally be contained, and may leave the concrete smooth. Acid water will not penetrate oil spots. 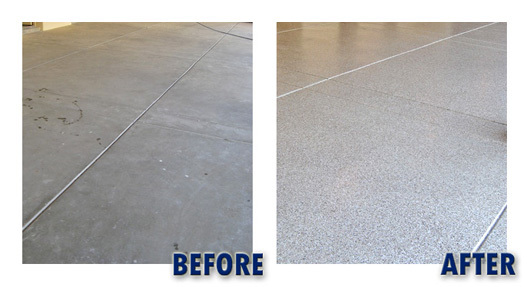 The concrete needs a roughed surface to grip to, and this is way we mechanically diamond grind the entire surface. Step 3 — The floor is than vacuumed of any dust and debris left from the grinding process. Step 4 — Apply 100% solid epoxy color coat of your choice. Step 5 — Apply color chips for a decorative quartz finish. Step 6 — Apply urethane finishes for a maximum abrasion resistance.